Pender R. McElroy « James McElroy & Diehl, P.A. Pender McElroy earned the Juris Doctor degree from the University of North Carolina School of Law, where he was a member of the North Carolina Law Review. After law school, he served as clerk for one year to Justice William H. Bobbitt of the North Carolina Supreme Court. 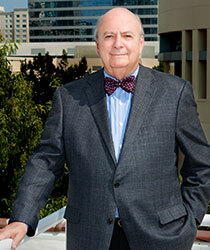 Pender was the managing partner of the firm for 30 years. He served as a commercial arbitrator for the American Arbitration Association for 40 years. He serves as Of Counsel to the firm. Pender represents and advises businesses engaged in many different endeavors including services, sales, manufacturing, healthcare, construction and real estate development and investment. His work involves sales, purchases and financing of businesses and real estate, contracts and disputes with suppliers and customers; employment issues; regulatory issues; corporate governance; and succession planning and estate planning for the owners and managers. He also is involved in creating trusts and administration of estates. Pender served on the board and is past board chair of Mental Health America. He was also a board member and past board chair of the Presbyterian Samaritan Counseling Center in Charlotte. He was a member of the Tryon Palace Commission. He is a member and past president of the Rotary Club of Charlotte and a Paul Harris Fellow. Pender is a former president of the Mecklenburg County Bar, former chairman of the N.C. Conference of Bar Presidents and a board member of the Mecklenburg Bar Foundation. He previously served on the boards and as board chair of Crisis Assistance Ministry, Legal Aid of North Carolina, Mental Health Association in North Carolina, Mental Health Association of Central Carolinas, Presbyterian Home at Charlotte (Sharon Towers), Charlotte-Mecklenburg Senior Centers and Community Health Services. He was a member of the N.C. Commission for Mental Health, Developmental Disabilities and Substance Abuse Services for 13 years, and served as its chairman for seven years.